NEXT 2011 Conference takes place in Aarhus, August the 30th and 31st 2011 at the architectural world landmark Aarhus City Hall (designed by Arne Jacobsen), in a new and engaging, interactive conference format. On August 30th you will sign in for the Conference at 9.30 am in Ridehuset. Enjoy a cup of coffee and some breakfast before leaving for Rådhuset at the other side of the street. At Rådhuset the Conference will start at 11.00 am. 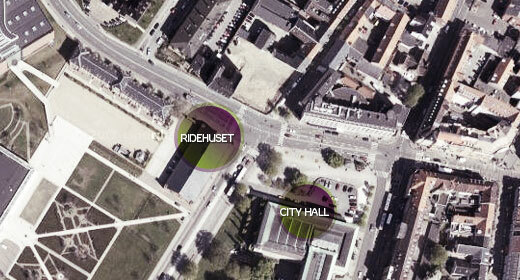 You will find parking spots next to the Hotel Radisson/Scandinavian Congress Center. In total you will find 1240 parking spots. The car park is open 24/7. 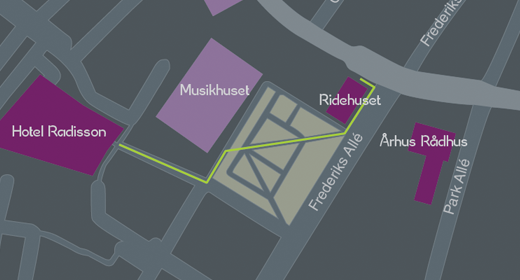 It is a 5 minute walk (400 meter) from Ridehuset. There is a 20 kr. fee per hour. You can pay by credit card. You will find parking spots next to the Hotel Radisson/Scandinavian Congress Center. In total you will find 1240 parking spots. The car park is open 24/7. It is a 5 minute walk (450 meter) from Rådhuset. There is a 20 kr. fee per hour. You can pay by credit card.